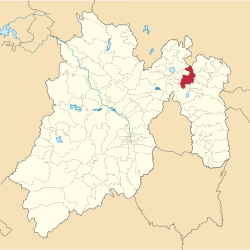 Tecámac is a municipality in State of Mexico in Mexico. The municipality covers an area of 157.34 km². The municipal seat lies in the town (locality) of Tecámac de Felipe Villanueva. 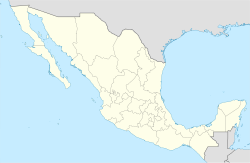 Its largest town, Ojo de Agua, with a population of 242,283 inhabitants, is the largest locality in Mexico that is not a municipal seat. As of the 2010 census, the municipality had a total population of 364,579 inhabitants. Urban park in Ojo de Agua, Tecámac. The town of Tecámac de Villanueva, a municipal seat, has governing jurisdiction over the following communities: Ozumbilla, Santa María Ajoloapan, San Lucas Xolox, Los Reyes Acozac and Ojo de Agua. The total municipality extends 157.34 km2 and borders with the municipalities of Zumpango, Temascalapa, Tonanitla, Teotihuacán and Ecatepec de Morelos. Municipality House in Tecámac de Villanueva. ^ "Bando Municipal de Tecámac 2015" (PDF). H. Ayuntamiento de Tecámac 2013-2015. Retrieved September 9, 2015. ^ "Tecámac". Enciclopedia de los Municipios de México. Instituto Nacional para el Federalismo y el Desarrollo Municipal. Archived from the original on May 20, 2007. Retrieved June 6, 2009.